For a long time, the tales of Norse voyages to North America described in the Saga of Erik the Red and the Saga of the Greenlanders were thought to be legends. It was not until the nineteenth century that historians and archaeologists began to investigate the subject of Pre-Columbian Norse exploration in earnest. The first to do so was the Danish historian Carl Christian Rafn, whose Antiquitates Americanæ (published in 1837) sought to ascertain the location of Vinland. Rafn’s claim that the Vikings had settled in North America was vindicated in the 1960s when archaeologists discovered proof of a Viking settlement in L’Anse aux Meadows in Newfoundland, Canada. Antiquitates Americanæ created a sensation in America. Rafn’s theories and his translations of Norse sagas were published in popular magazines, pamphlets, schoolbooks, etc. Many Americans came to see themselves as heirs to the legacy of Norse explorers and celebrated the kinship between Vikings and Anglo-Saxons. Among the Viking-themed poems and stories published during this time was Henry Wadsworth Longfellow’s ballad “The Skeleton in Armor,” which immortalized a skeleton outfitted in armor that was unearthed in Fall River, Massachusetts in 1832. Longfellow believed that the skeleton belonged to a Viking. The poem begins with the skeleton rising from the dead to tell the story of his life. The Viking recounts his exploits as a young adventurer. He fell in love with the daughter of a certain King Hildebrand and eloped with her after the King objected to their marriage. The King chased them across the Atlantic; he and his crew fought the Viking and were defeated. The depiction of an adventurer rebelling against a king was perhaps meant to imply a parallel between Americans and the Vikings. Longfellow was an enthusiast of all things Scandinavian. He studied Old Norse and modern Scandinavian languages and spent time in Scandinavia. He was a great admirer of the Swedish poet Esaias Tegnér, whose Swedish-language paraphrase of Frithjof’s Saga became a national epic and established his status as the father of modern Swedish poetry. Goethe praised its “old, mighty, gigantic-barbaric style of verse” and urged that it be translated into German. Longfellow wrote a lengthy review of it (which also included his own English renderings of excerpts from the poem) that was published in The North American Review in 1837. The article played a role in introducing Scandinavian literature to America. Longfellow’s popularity helped bring Scandinavian literature to a more general audience. The modern Scald has written his name in immortal runes . . . on the mountains of his fatherland, and the cliffs that overhang the sea, and on the tombs of ancient heroes, whose histories are epic poems. Indeed we consider the “Legend of Frithjof” as one of the most remarkable productions of the age. . . . He dwells in that land, where the sound of the sea and the midnight storm are the voices of tradition, and the great forests beckon to him, and in mournful accents seem to say, “Why hast thou tarried so long?” Those “ancestral voices” have not spoken in vain. In this spirit the poem has been written, and in this spirit it must be read. Tegnér’s influence on Longfellow can be detected in his famous poem Evangeline. The arc of the poem mirrors that of Frithjof’s Saga: Evangeline and Gabriel grow up together, are separated by fate and suffer misfortunes, and are then reunited. Both Gabriel and Frithjof are known for their strength and courage. Both Evangeline and Ingeborg wait on the seashore for Gabriel and Frithjof respectively. The fathers of both heroines are buried on the seashore. Frithjof wants to be “free like the storm of the mountains”; Gabriel also seeks freedom and wants to explore Western lands. The rustic scenery of Acadia may have been influenced by Longfellow’s impression of the Swedish countryside, which he describes in the introduction to his commentary on Frithjof’s Saga. Frithjof also speaks of building Ingeborg a cottage by the sea, and the Viking recounts that he built a tower “looking seaward” (an allusion to Newport Tower, now believed to have been built by English colonists in the mid-seventeenth century). 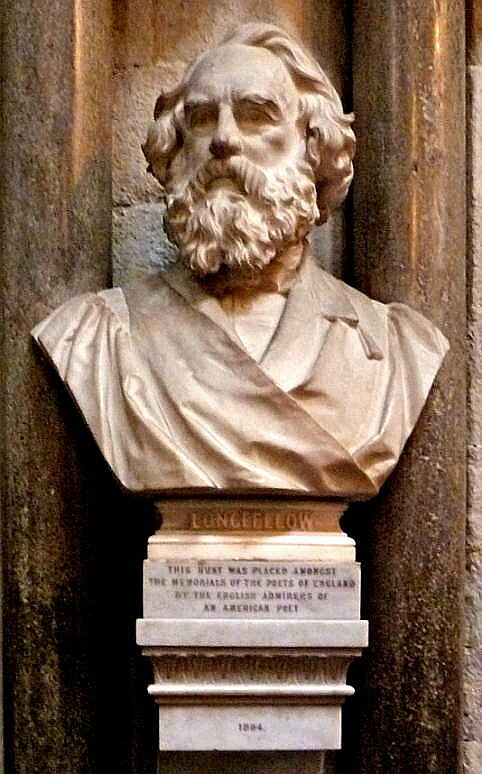 Longfellow was also influenced by Tegnér’s metrical style, particularly his use of a different meter for each of the poem’s 24 cantos. Longfellow’s “The Saga of King Olaf” is comprised of 22 poems that all differ in meter. The Saga of King Olaf was inspired by Longfellow’s reading of the Heimskringla, a collection of Old Norse kings’ sagas written by Snorri Sturluson. The poem loosely chronicles the exploits of Olaf Tryggvason, King of Norway from 995 to 1000. The paradox of this poem is that it celebrates Olaf’s forced conversion of Norway to Christianity while also glorifying warlike and heroic values and emulating the style of ancient pagan sagas. The triumph of Christianity would eventually lead to the demise of the pagan heroism embodied by Olaf. Despite this flaw, the poem is a great achievement. Theodore Roosevelt read it as a boy and wrote that it sparked his interest in Old Norse literature. The narrator of the saga is a musician referred to as “the blue-eyed Norseman,” a character based on the Norwegian violinist Ole Bornemann Bull. Longfellow was a fan and personal friend of his. Bull performed in the United States several times and attempted to found a Norwegian-American settlement in Pennsylvania. He was also an ardent Norwegian nationalist and co-founded what later became Norway’s National Theatre. He was a vocal proponent of Rafn’s theories and may have proposed the idea of erecting the statue of Leif Erikson in Boston. Strength is redoubled! . . .
Outside of his ship could run. On its summit, like a sun. First to come and last to go. Mantle like a flame of fire. Never away from my foes! On the Day of Doom! With its crest of steel. This poem may have inspired Thomas Carlyle to include Olaf in On Heroes, Hero-Worship and the Heroic in History. Longfellow’s contradictory attitude toward Norse paganism also manifests in “Tegnér’s Drapa,” a eulogy for Tegnér composed after his death. Longfellow associates Tegnér with the Norse god Baldr and mourns the passing of the old gods (in the Poetic Edda, the death of Baldr is seen as an omen foretelling Ragnarök). But he then goes on to praise the emergence of a new order that values “love” over violence and exhorts the listener to emulate the Vikings’ love of freedom rather than their taste for war and bloodshed. In this Longfellow was not unlike C. S. Lewis or J. R. R. Tolkien. (Incidentally, Lewis read “Tegnér’s Drapa” as a child and credited it for awakening his devotion to what he later termed “pure ‘Northernness.’”) He much admired the heroic, Northern spirit of paganism, but he could not rid himself of the notion that Christianity represented a more advanced phase in human history. Longfellow has been rightly criticized for his occasional lapses into sentimentality, seen here in his praise of Christian virtues. Of course, modern academics criticize him for this not because they want to return to Viking-style barbarism, but for the same reason that they ridicule neo-Romantic music: his poetry is lyrical and expressive and eschews obscurantism. Longfellow’s other poems of a Norse/Germanic character include “King Witlaf’s Drinking-Horn” (Witlaf/Wiglaf was a ninth-century Mercian king) and “The Discoverer of the North Cape: A Leaf from King Alfred’s Orosius,” which dramatizes the Viking explorer Ohthere of Hålogaland’s encounter with King Alfred of Wessex. ‘Fly!’ shouted they, ‘fly, he who can! ‘Fly!’ shouted they, ‘for shelter fly! Path of the Dane to fame and might! Longfellow did not comment much on political topics (slavery being the exception). But his admiration for nationalists like Tegnér, Ewald, and Ole Bull suggests that he was sympathetic to ethnic nationalism. There was also a racial element to the fascination with Vikings among Americans of the period since the Vikings were recognized as sharing their Northern European heritage. Longfellow is lauded for his cosmopolitanism, but his vision for American national literature was cosmopolitan only in the sense that he believed that it should reflect America’s European roots as well as a distinctly American element. (He did believe that all great works of art and literature express “universal” themes, but this view does not preclude nationalism; Wagner himself held a similar view.) He was a cosmopolitan in the best sense of the word: an American patriot with a pan-European sensibility who promoted brotherhood between America and Europe. His engagement with Scandinavian/Norse literature is but one example of how nineteenth-century Americans interacted with and were influenced by their European cousins. The skeleton probably belonged to an early English settler or an Indian. Nonetheless, it is quite possible that the Vikings could have reached as far south as Massachusetts. Henry Wadsworth Longfellow, “Tegnér’s Frithjof Saga,” The North American Review, vol. XLV (1837): pp. 150–51. For a more detailed comparison, see Anton Appelmann, “The Relation of Longfellow’s ‘Evangeline’ to Tegnér’s ‘Frithjof’s Saga,’” Publications of the Society for the Advancement of Scandinavian Study, vol. 2, no. 3 (July 1915): pp. 165–180. Theodore Roosevelt, An Autobiography (New York: Scribner, 1922), p. 17. The first three verses of the first canto were set to music by Blood Axis in their song “Reign I Forever.” Edward Elgar’s cantata Scenes from The Saga of King Olaf was also based on the poem. Published: September 20, 2018 | This entry was posted in North American New Right and tagged A. Graham, articles, Carl Christian Rafn, Esaias Tegnér, Henry Wadsworth Longfellow, Norse mythology, Norse sagas, North American New Right, originals, poetry, Vikings. Both comments and trackbacks are currently closed. Tegnér’s Frithjof’s Saga in English translation: https://archive.org/details/frithiofssagafro00tegniala. He translated poetry from 18 languages and could speak eight fluently.